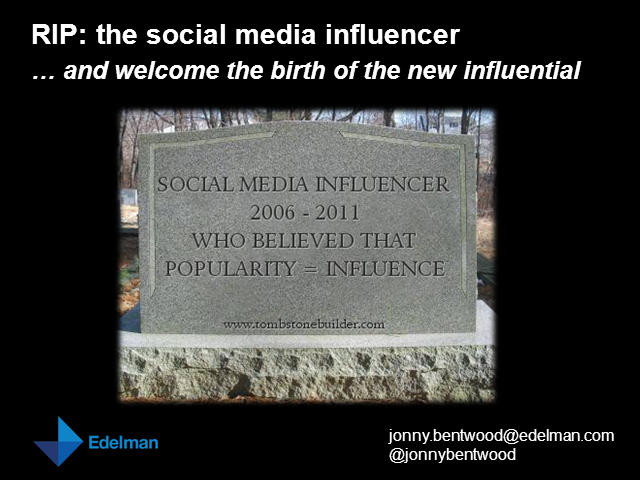 This is the sermon to commiserate the death of the influencer. This expert who would magically solve problems by regurgitating a tweet or a blog post. This magus who cared little for context, community or conversation but whose narcissism for their own popularity made them believe their power of their own word. But on this sad day, we welcome a newcomer to our fold. This person, this new influential can finally be identified and engaged with in a way that is appropriate to their behavioural characteristics. RIP the social media influencer and long live the new influential.